WordPress Archives - io design & illustration, inc. 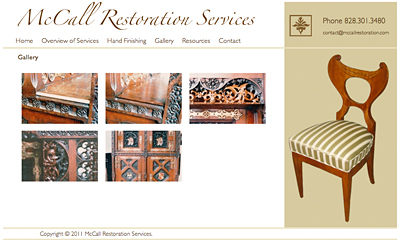 The home page of McCall Restoration Services website has clean lines and classic colors picked up from a restored antique chair. On the gallery page close up images of restoration work can be viewed. 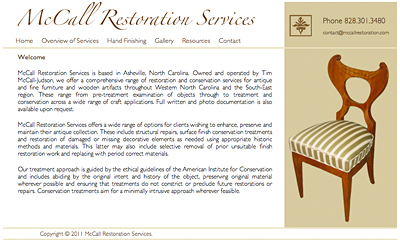 McCall Restoration Services, based in Asheville, North Carolina, offers a comprehensive range of restoration and conservation services for antique and fine furniture and wooden artifacts throughout Western North Carolina and the South-East region. McCall Restoration Services offers a wide range of options for clients wishing to enhance, preserve and maintain their antique collection. These include structural repairs, surface finish conservation treatments and restoration of damaged or missing decorative elements as needed using appropriate historic methods and materials. This latter may also include selective removal of prior unsuitable finish restoration work and replacing with period correct materials. 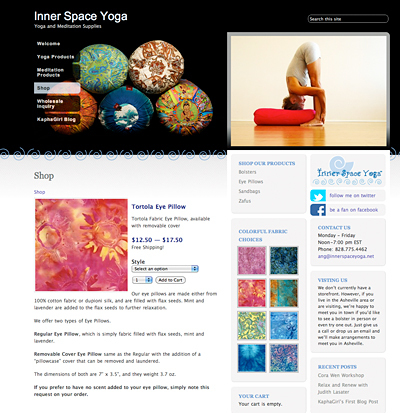 Owner, Tim McCall-Judson, wanted a custom WordPress site with clean lines and a sense of sophisticated style. He needed a site that could include photo galleries of work he has done as well as written details on his services. Visit the McCall Restoration Services site for more details and images of Tim’s beautiful restoration work www.mccallrestoration.com.